Christmas Eve trumps Christmas Day. There is said it. I like Christmas Eve better. It's the day when all the excitement has built to this big crescendo but it hasn't yet peaked. There is a distinctive buzz in the air as you go about cooking up Christmas delicacies whilst Nigella chirps from the TV in the background. The fairy lights are turned on hours and I mean hours before any hint of darkness and Michael Buble is on a military style loop and I pity the poor fingers that try and change it or adjust the volume. No other day of the year are the children so well behaved in a last minute bid to impress Santa or make amends. And it is THE one night of the year when my kids not only want to go to bed, they come close to breaking limbs as they clamber over each other in a rush to get up the stairs. WHY can't we celebrate Christmas at least a couple more times a year? Parents would pay for that to happen. The whole leaving cookies and milk out for Santa and carrots for the reindeer - it never tires on me. It is just one part of the whole kit and caboodle, the build up, the special magic that is Christmas Eve. It is the same routine every year in our home. We make sure that no matter how late we arrive home from any festivities on Christmas Eve, slow delicious time is taken carrying out the final ritual of laying out some sustenance for Santa. The carols in the Myer bowl are playing on TV and the kids are in a pair of brand new PJs purchased specially for this night. They start with the food and home made cookies are a must, although my Mum HATES me saying that because "They are Biscuits here in Australia Sonia, BISCUITS". Milk is poured into cute little milk bottles, because *ahem* Santa much prefers to drink it out of old fashioned style milk bottles and nothing to do with the fact that I am a sucker for any excuse to use those cute vintage bottles I insisted on purchasing. Carrots are laid on a special Christmas plate beside a bucket of water next to the rose bush at the front door. And the final touch - the piece de resistance - Santa's thank you letter is propped up against the milk bottle under the twinkle of the fairy lights on the tree. When I saw these absolutely adorable Santa's Cookie Mix from Sweet Health on Down That Little Lane I totally baggsed doing the giveaway. Because these little beauties are RIGHT up my alley. At $13.95 each they are everything your kids need to bake Santa the best cookies ever - yes Mum I mean Cookies. 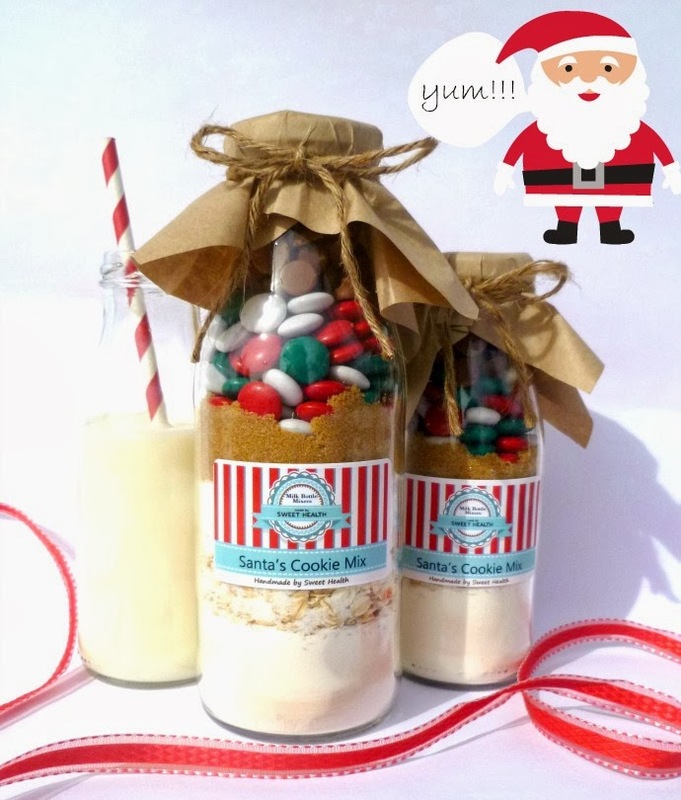 The ingredients are already measured out and and then packaged up in the cutest vintage style milk bottle that are just screaming to be filled with milk and a stripey straw and placed next to a plate of the freshly baked cookies for Santa. These take and bake cookie mixers are filled with a delicious mix of choc chips, oats and smarties and make 12 decedent festive cookies. Get them for your kids, give them as gifts, heck just buy these gorgeous suckers for yourself. 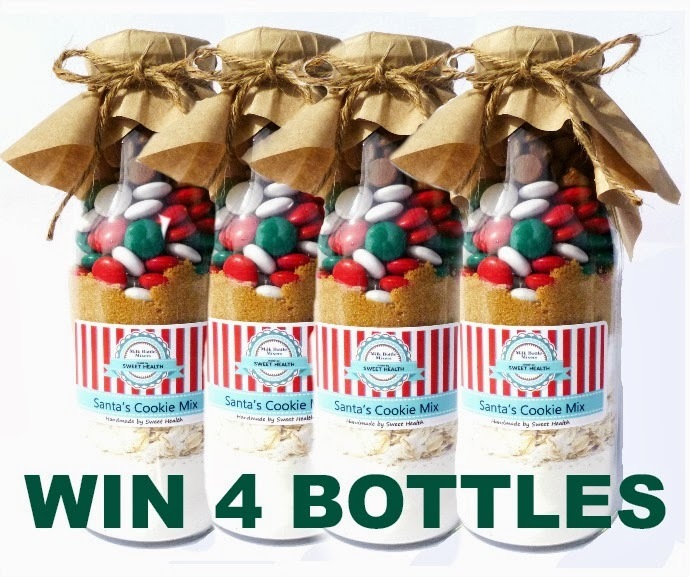 We have 4 bottles of Santa's cookie mix to go to one lucky winner. So you know the drill so get cracking - leave me a comment telling me what you leave out for Santa and the answer that leaves the biggest smile on my face wins. Make sure you follow the prompts on the Rafflecopter widget below to make your entry official. The competition is open now and runs until 08/12/13 7pm AEST and is open to Australian residents only sorry.